YES, the little Russian has finally left our club, we’ve been calling for his head all season and that reached new heights at the game against United when along with Wenger he was made scape goat. YES he showed no heart, hunger & desire and was more of a pedestrian on the pitch most times. BUT why doesn’t this move feel good in the end, why aren’t we rejoicing seeing as its what’s we wanted? Are we happy to see him leave NOW? NO!, NO! !, NO!!! For someone that provided the goal that took us to 4th and expected to start or at least be involved at the San Siro, he not only had no hand in the game, he also didn’t play in the subsequent game. If the transfer window was open and he left with a replacement coming in, we would all be glad, but this is a very stupid and ill thought out move by Wenger. He never really played Arshavin in his preferred position and relegating him to play for the reserves must have been the straw that broke the camel’s back for Andrey. So what happens if any of Walcott, Gervinho or AOC gets injured? We started the season with 5 wide players and now we have just 3 with one seriously under performing. SMH. Small matter of the derby on sunday. We’ll beat them right? We always have. Forever in our shadows Tottenham. Right? We welcome our small brothers 10 points behind them and an inferior goal difference. 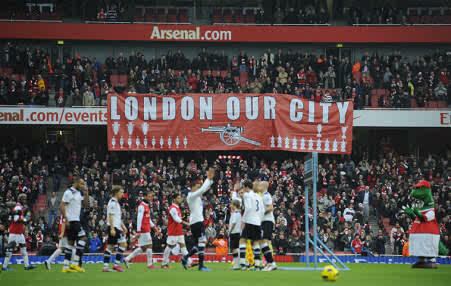 This season, they’re playing like Arsenal(without the comical defending) and we are playing like Sp*rs. As much as I want to credit them for a solid season so far, they’ve not had the misfortune other clubs competing with them have had this season. Kroenke is going to be at the game for the first time in 9months, good to see its only when there’s crisis our majority shareholder comes out. Call me crazy but I’m confident about this game, we can get away with a 2-1 victory so long we remain disciplined and the subs come in when they should. A win would lift the mood around the Emirates and remind Spurs that despite being ahead, its just temporary & they’ll always be in our shadows. #COYG!!! Remember last and upper week when I said I’m going to run out of words for Van Persie, well I have, now I think he needs to take a break or I need to learn Dutch adjectives synonymous with brilliant and on fire. Two goals in the second half won the game for us. Arsene stuck with the same line up for the first time since January 2010. Below are the player ratings. Passenger the entire match. Djourou had to come on and ruin the clean sheet for him. With 3 interceptions, you’d think he was born a right back. Has settled into the role although his presence there limits our attacking play on that wing. The pace at which the brazilian is endearing himself to the Emirates faithful is lovely to see. He was rarely troubled and at times had more attacking to do than defending. Near flawless performance from the Spaniard, he reminds me of Petit-Gilberto, battles hard in the midfield, plays the simple and easy passes and never puts us in trouble. Not for poor finishing from the likes of Theo & Gervinho, he would have claimed 2 assists on the night. He continues to grow with every match. Should have done better with the chances provided in both halves. He defended superbly well which is good to see. This guy right here, is on course to be the worst finisher in Arsenal’s history. He stammers each time he’s put through and I’ve seen females that finish better. Needs a goal quick. god!!!!!! is the new word I came up with for Van Persie, looked like it was going to be a barren night and from no where Boom!! 2 goals. Owes the first to Song’s brilliant run and the other to Vermaelen’s flick. Gave away the ball that led to Dortmund’s goal even though he was played into trouble by Song. Another double for RVP and another 3 points that has sealed our qualification to the next round and has probably earned him rest for the last group match. Do have a lovely night. RED HOT ROBIN!!! !, CAPTAIN FANTASTIC!!! , one day I’ll get tired and start repeating superlatives in describing Robin Van Persie. The Dutchman is scoring goals like its out of fashion and proved match winner again today. 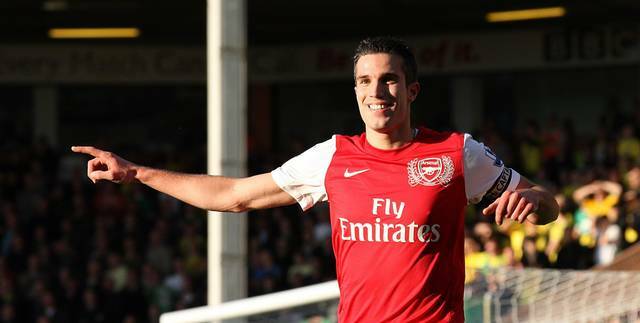 31 goals in 2011, 13th on the Arsenal all time scorers list and looking likely to bag the player of the month again. Arsene was forced to make a change as Jenkinson was ruled out through injury. Mertesacker came in and Kozzer moved to RB. We conceded the first goal due to stupid defending from the flagpole German but RVP hit back with two goals in each half to seal all 3 points. Below are the ratings. Playing at RB and looked confident, had a lot of interceptions and cleared his lines well. Tried to play a lot of ambitious passes. Cut that out son. Tempted to give him a lower rating, just because you’re slow doesn’t mean you have to be sluggish. Poor for the opening goal for someone of his status. If RVP had a twin that played at CB and was on fire like him, its Thomas Vermaelen, another excellent game and he rescued Mertesacker over and over again. Brilliant man. Probably his best defensive showing since joining us. Marauding performance going forward and good at the back. Had an easy game in the second 45. After receiving such high praise in the previous week he comes up with a very lackluster performance. Was good in the first half but very sad to watch in the second half. Playing for Wales midweek must have dulled his game but still was hardworking throughout, always available for passes and willing to attack. All he lacked today was a goal. Absolutely barnstorming game from the English man. Assisted the first goal, saw a shot cleared off line and saw another bounce off the upright. Looked like he was heading for a frustrating afternoon after spurning 3 clear chances. But he stuck to it and was rewarded with two goals. Another win, another dutch brilliance on show, it can only get better as we slowly but surely continue to climb up the table. See you in the comments. EXCLUSIVE : Arsenal “beat the crap” out of Chelsea: A Unique View. Almost 24 hours after and I’m still struggling to come to terms with the events of yesterday. Most gooners would have accepted a draw going into the game but the guy who wrote that script had other ideas. I won’t say I was too surprised when Chelsea drew first blood, I was only pained it had come after we missed two great chances. Lampard capitalized on a Mert4 misjudgment to power a header past Sz13. We had a lot of time to grab our goal and I hoped it would be an equalizer rather than a consolation. A spell of good possession and Ramsey ripped the Chelski defence to put Gerv through on goal, the winger showed great awareness to pass to Robin who had the simplest of tap-ins. We were back on level terms but it didn’t last. Just before half-time, Terry got in front of Mert4 to somehow put the ball in the net. A lot of people were quick to blame the big man, but that ball shouldn’t have got that far in the first place. We trailed at half-time and it was really difficult to see how. Chelsea’s Chief Executive, Bruce Buck was expecting “Chelsea to beat the crap out of Arsenal”. I really do not care what did the magic, whether it was Wenger’s team talk or the thought of Buck saying “I told you so” after the game. What I know is that the Arsenal that emerged from the dressing room for 2nd half wasn’t the same team that went in at half time, in terms of mentality at least. We played with much more precision and spirit, and got our equalizer within 5 minutes. Andre Santos latched onto a pass on the left and shot through Cech’s legs to claim his 2nd for the season. Clichy managed just 2 in how many years again? Santos’ celebration was top notch too [in yer face Ramires!]. We were in the ascendancy, doing the simple things well and keeping the Chelski strikers in check. Walcott, who had been having a great game decided to do something different. He ran at the Chelsea defence, lost the ball, won it back, beat two defenders with a simple skill and speed, and finished excellently. I went bonkers! The comeback was complete, and the 3 points were within sight. Trust Arsenal though, the kings of dramatic endings, Mata’s long ranger [after a foul by Lukaku on Santos] leveled the scores and set up an amazing final 10 minutes. I feared the worst and hoped we could hang on for a point. But the thing is when you are the good guy, you get lucky a few times. “Luck” is Malouda playing a poor backward pass when a forward pass seemed easier. “Luck” is Terry slipping on his backside and letting the ball pass, “Luck” is the ball falling to none other than Van Persie. The look on the faces of Chelski fans as VP faced Cech is absolutely priceless! He confirmed their fears, rounded Cech and passed into a waiting net. 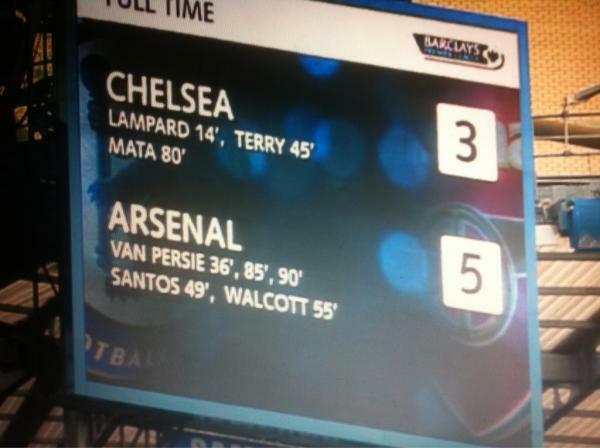 We were back on top, Chelsea were rocked! They threw everything they had forward but created nothing really. It even cost them as we broke on the counter, got the ball to RVP who rifled a shot past the helpless Cech to grab his hat-trick. 5-3 and we were truly going back home with maximum points. One could see from the celebrations what those points meant to the lads. It was a pulsating encounter and in recent years, we would normally come out of games like this ruing our luck. This time around, the lads gave their all, kept their focus and were duly rewarded. No need to wax lyrical about RVP, we all know he is going to heaven! Koscielny was a monster yesterday, and of the 8 defenders that lined up for both sides, he looked like the only one who had a clue what he was doing in the first half. If he keeps developing at this rate, he’ll be unplayable in the not too distant future! Andre Santos had a poor first 45, but a commendable 2nd. I particularly like the way he wins one-on-ones. His goal scoring ability is a breath of fresh air too. Walcott showed us what good decision making can do to his game, Arteta played with more freedom, Gervinho’s unpredictability and dribbling really helped, Song was colossal and worked his socks off, and Ramsey was superb again. Our defending still needs to be worked on though. TV5 returning is great news and I expect us to be much better. I’d love to see a back four of Kos-Mert4-TV5-Santos! After 7 wins in 8 games, I was hesitant to say we had turned the corner probably because 6 of those 7 were at home. With yesterday’s win, I’m pretty confident we have. Are we back to our best though? As much as the game showed how awesome we can be, it also exposed our faults. We should expect to get punished if we keep missing clear chances and defending atrociously. Gervinho especially needs to work on his finishing, we were not so luck against the Sp*ds! Below are some of the funniest tweets that went around yesterday after we ran riot at the bridge. MARRY ME VAN PERSIE came the tweet at the end of the final 90. Another masterful performance from the new darling of the Arsenal faithful. What can we do without him? I don’t want to find out. He must stay fit. In a game where despite being on top, our defence had other ideas and threatened to spoil it all. 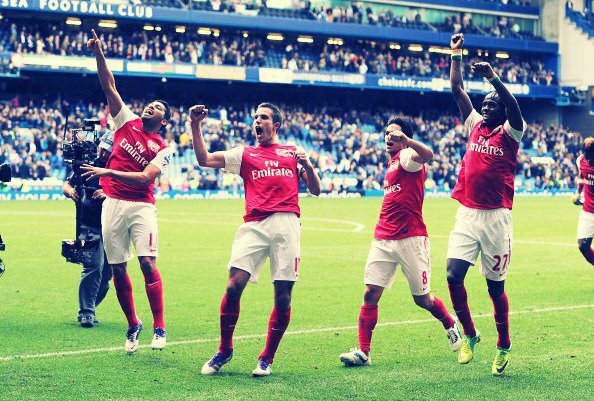 But the likes of Arteta, Song, Ramsey, Walcott, RVP stood tall and took matters into their own hands. Santos also bagged his second goal, Arteta his first assist and Gervinho his fourth. Below are the player ratings. Nothing he could do about the three goals. He was shaky and at the same time very solid. Had a tough game against Mata and Torres but did ok for someone playing out of position. Oh boy, oh boy, I’m falling in love with this boy right now. The last 5 games he’s been an absolute beast and is surely guaranteed a spot when Vermaelen returned. Continues to have a Jekyll and Hyde season. Started well then became poor but recovered well and won all aerial balls in the 2nd half. He’s better suited to the European game. Controlled performance from the spaniard, nothing risky, completed his passes and defended well. For someone so timid he bagged his first assist for the club with a slide rule pass for the 5th & final goal. Very matured performance from the Welsh skipper. Full of energy and invention. Did enough against Lampard and co and on another day would have bagged an assist and a goal. Shamed himself after missing an easy goal but put in an action packed performance and was a thorn in Bosingwa’s side the entire game. Assisted Van Persie again. Budding on-pitch romance between those two. Five star performance. I’m fast running out of adjectives to describe Van Persie. Not in recent memory has a captain led by his performances the way he has this season. Magnificent hattrick. Each goal beautiful in its own way. Credit must go to Arsene wenger, whatever he said to the lads at half time worked like a charm as the players upped the ante and defended better and got all the three points. Great weekend to be a gooner. One of our bogey teams visits the grove today, with Stoke doing well in the top 5 of the of the table and us on the second page of the table in 11th position, a win is very much needed. But have no fears, Delap or not, Arsenal have never lost to Stoke at home, at least not in this modern era. Their bogeyness only works at the Brittania. We are a team on ascendancy and what better way to stamp that than beat a team that has always been a thorn in our sides and then that Ramsey incident. I must say, with Stoke’s approach to the game I fear for Van Persie but they should be more worried about our own attacking threat. Bar RVP, our attackers have been poor in recent weeks and the one actually banging in the goals(Oxlade-Chamberlain) continues to languish on the bench. Our exotic number 9 hasn’t played a premier league minute, nott one and Chamakh continues to come in and go out of the squad entirely. For this game, I’d gladly take a 1-0 victory but we’re at home so I say go for the jugular and kill them off, give the lads a morale boosting win a la Sunderland. I expect the defence to continue their impressive play from the last two games and hopefully see Park play today. One-Nil-To-The-Arsenal read the scoreline after 90 minutes of play yesterday and despite the poor performance from more than half of the team, the result is the most important thing as it sent us to the top of the table. Due to fitness concerns of certain players, Le Boss made just two changes as Arshavin and Santos came in for Gervinho & Gibbs. The game in itself had little to show for attacking wise as there were a lot of half chances with both sides having penalty claims which weren’t given. The pace of Remy & Valbuena repeatedly caused problems in the Arsenal half with no serious threat. Jenkinson made a good account of himself and showed desire, commitment and was ever willing in the game, Koscielny was an absolute rock and nullified every threat he faced. Song picked up an early booking which could have cost us but did not. When I called him an average player, I got a lot of stick, well he did little to change my opinion of him. The attacking threat which we were supposed to carry with Walcott and Arshavin was absent as they both looked like lost puppies, Arteta can’t make a forward pass and direct one to save his life as he kept on passing to the wings. Walcott had the chance to put us ahead but fluffed his lines as the defender got back in time to rescue his team. 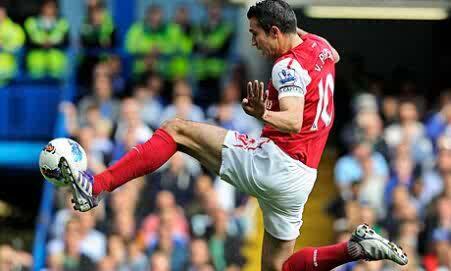 Up next was RVP who saw his shot blocked by the Marseille keeper. Before this, AW had sent on Gervinho , Djourou & then Ramsey for Walcott, Jenkinson(injury) and Arshavin. Djourou would later send a cross into the box which landed gratefully at the feet of Ramsey who took his finish well. Too late for Marseille to muster any comeback as the clock had expired. For once, we won without playing well and I knew what it felt like to be a United/Chelsea fan. If we can continue to get more results like this without playing well, I and many fans worldwide would be grateful.